(1) Introducing the Gathas: This lecture will be a general description of the Gathas– their poetic style, their content, and their importance for not only post-Gathic Zoroastrianism, but for religions and philosophies of the world.. Reasons will be provided for dismissing the views of some scholars that the Gathas are concerned with a primitive materialistic ritualism, and also that Zarathushtra was not a real historical personage who was the single author of th Gathas. Rather it will be indicated that Zarathushtra was an absolutely awesome innovative spiritual leader, intellectual, and poet. The lecturer will summarize and provide examples for several of his foremost discoveries as pertains to the striking intricacies of his comoositional style: a) concentric schemes for each individual poem; b) phonic encoding of the theology of the Gathas; c) the compositional mechanics whereby the individual poems were generated one after another; d) how Zarathushtra lampooned and lambasted the earlier hymn to Haoma. Husserl’s concept of “open intersubjectivity” expresses the peculiarity that the environment appears as being there for “anyone”. The possible co-perceivers structurally implicated have been considered as anonymous, unspecified, which is another way of saying that the horizontally implicated “anyone” refers to no one in particular, but to “any alter egos whatever”. I will focus on this tacit structural referencing of potential others and challenge the claim of anonymity. What I have in mind is not merely that the potential others implicated in our experience of the cultural world are particularized as co-members of one’s community or “homecomrades”. Instead, my point is that the implicated others (be it co-perceivers or co-members) are specified associatively in the light of our earlier interactive experiences. Differently put, I want to show how the “co-positing” of others necessarily “echoes”, and is “colored” by, our earlier intersubjective experiences (and the ensuing introjections). The way in which we tacitly implicate anyone (i.e., typical co-perceivers and fellow humans) is influenced by the way in which we have interacted with particular others (i.e., particular tokens), whom serve as the primal institutors of the idea of “a typical perceiver”. Importing insights from phenomenology and psychoanalysis, I will discuss the asymmetric structure of social perception and the sedimentation of experience, and challenge the assumption of the anonymity of the “anyone”. In contrast to constructivist and reductionist denials of the existence of religious experience, this paper presents a phenomenological realism of religious experience, particularly by elucidating the function of the epoché in the phenomenology of religion. Some interpretations of the epoché preclude any commitments to realism. For instance, Husserl’s epoché is typically understood as a methodological device for “bracketing” any assertions arising from the natural attitude, which would entail holding in suspense any metaphysical claims about the existence or non-existence of religious experience. Drawing on the works of Emmanuel Levinas and the Dutch phenomenologist of religion Gerardus Van der Leeuw, I outline a different interpretation of the epoché, one that suspends the understanding while nonetheless affirming the real existence of religious experience. Van der Leeuw and Levinas approach phenomenology from different contexts, Christianity and hermeneutics for the former and Judaism and ethical metaphysics for the latter. Following Heidegger’s existential turn in phenomenology, both thinkers seek to live the epoché such that it is not a mere methodological device but a pre-reflective mode of being, a restraint that is fundamental to the openness of human existence to the world. Bracketing is the process whereby the understanding reaches a limit that opens out onto that which is other in its irreducible otherness (Levinasian “alterity”). The reality of the other is given in a pre-reflective encounter while one suspends one’s own understanding of the other. Furthermore, both Van der Leeuw and Levinas argue that such openness to the other is what defines religious experience, which means that religious experience is real, and it is a constitutive feature of human existence. The human is thus “Homo religiosus,” as Van der Leeuw says. 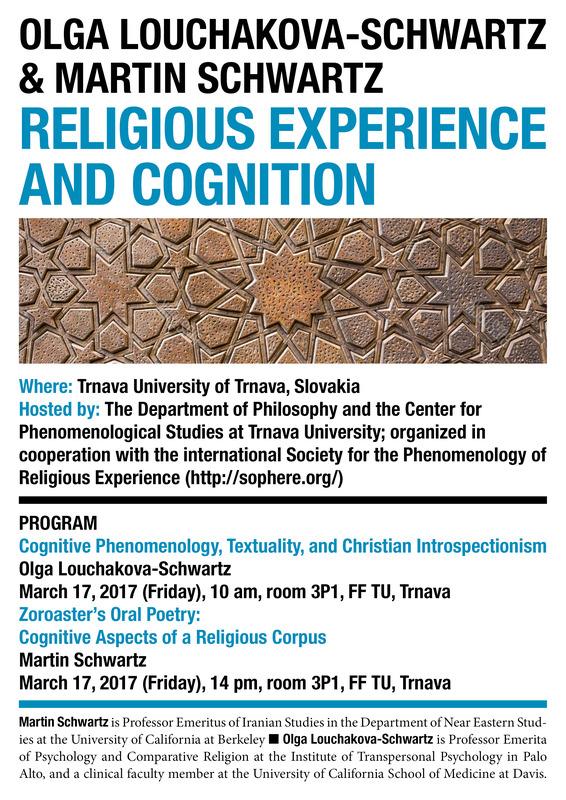 This entails a provocative suggestion that the practice of phenomenology involves a religious dimension, and conversely, every religious experience involves an epoché. April 7, 2017. Peter Costello, Providence College, USA . Youtube video. Outline. Full text. Using Derrida’s notion of hospitality from Of Hospitality, I argue in this lecture that Husserl’s phenomenology has always attempted to write its descriptions of objects, world, and other people in as welcoming a way as possible. Phenomenology welcomes and stands in solidarity, in other words, with what remains on the margins. Using the famous text concerning “The Principle of All Principles” from his first book of the Ideas, as well as sections from Formal and Transcendental Logic, Cartesian Meditations, and The Crisis of the European Sciences, I will show more specifically how the manner and motion of givenness is to draw us toward the margins of experience. Our objects, our world, an the other people who lead us toward them from within–these all are meaningful dis-placements toward and from the margin. Phenomenological explication, for Husserl, becomes then a kind of “absolute beginning” and a continuation of givenness as it founds the non-primordial dichotomies of inner and outer, immanent and transcendent. After having determined to what extent phenomenology is primordial, hospitable and aims at the margins, I will turn to texts from the Books of Deuteronomy, ​Ruth and Esther, as well as the Gospels of Luke and John to show how phenomenology demands a privileging of the discourse of the stranger and the act of welcoming. Phenomenology demands, in other words, that we fashion our political and religious lives in a hospitable way toward the stranger as an echo of the very motion of experience. March 17, 2017. Olga Louchakova-Schwartz. SOPHERE lecture at the University of Trnava, Slovakia. 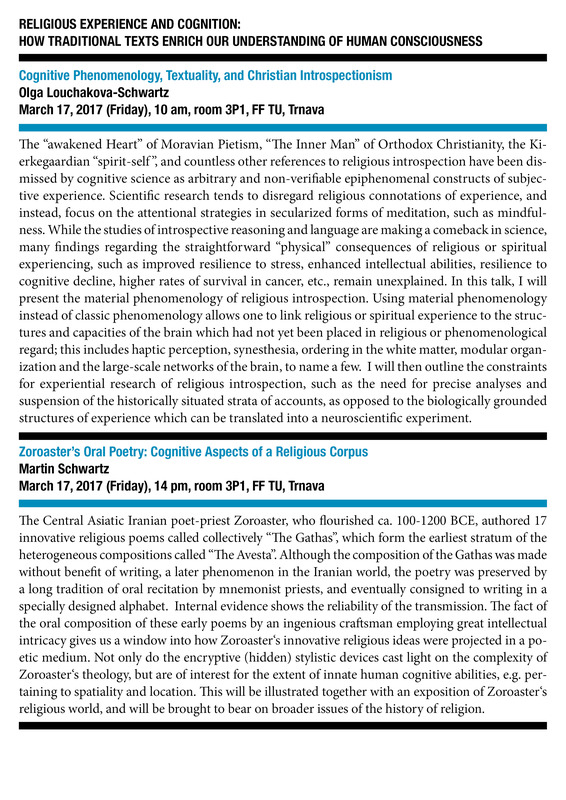 Cognitive Phenomenology, Textuality, and Christian Introspectionism.